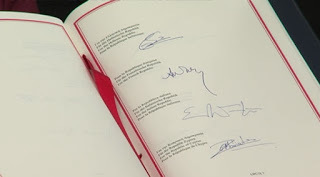 On 7th August 2013, Austria became the first country to ratify the Agreement on the Unified Patent Court. However for the UPC Agreement to enter into force, thirteen instrument of ratification, including Germany, France and the United Kingdom are deposited. In the United Kingdom, the UPC Agreement was laid before Parliament on 14 June 2013. The Agreement must also be given effect in UK law before it can be ratified. This will mean making changes to UK law to ensure that it complies with the provisions of the UPC Agreement. The first step of this process is provided for in the Intellectual Property Bill introduced into Parliament on 9 May 2013. Clause 17 of the IP Bill will enable the Government to make the detailed changes to UK law at a later date using secondary legislation which will be considered by both Houses of Parliament.